Currently, there are over 467 million users on LinkedIn, and that’s a lot of people, all in one place, trying to do similar things to you. You’re a small fish in a big pond, and you need to find a way to stand out amongst the pack. The most-viewed element of any LinkedIn profile is the headline – the same line of text under someone’s name. With everything on your profile, you want to capture the attention of the reader as soon as it’s seen, otherwise you risk them losing interest and going elsewhere. That headline could simply say Senior Account Manager at [company], however, you now know exactly which accounts they manage, and what their expertise is. You understand exactly how many years’ experience they have in that position, and you can judge about whether you want to work with (or hire) them. To recap: be creative, outline who you are (more than just your job title), and be genuine. Your LinkedIn profile is your place to showcase the real you. If you’re searching someone out on LinkedIn, or if you’re looking for a job, you want the methods of communication to be quick and easy. Sometimes, sending a connection request can take a while (as someone may be busy doing other work), however an email or a phone call is (normally) instant. Unless you are connected to someone, you’re unable to see their contact details, and you have to wait to be connected. If you are someone who wants to receive opportunities from potential clients, or headhunters, outline your main contact details at the end of your ‘Summary’ section. You can list a phone number, an email address, or both – but make it easy for people to contact you! You can always send them a connection request once you’ve received their email, and you’ll save yourself a lot of time in the long run. I’ve seen lots of people who forget that LinkedIn is an online networking platform, so end up hiding their contact details – and you can’t easily offer them a prime job or work opportunity! Recently, a lot of individuals have explained how they feel that LinkedIn is becoming more and more like Facebook – with a vast majority of non-business related updates, such as selfies, quizzes, inspirational quotes etc. There are now even Twitter accounts dedicated to highlighting awful LinkedIn updates, so steer clear! Ensure your update isn’t just click-baiting, and it’s genuinely interesting to yourself and your peers. You don’t want to be known as the person who posts content for the sake of it – make it interesting, entertaining or educational, and ensure your connections get something out of it! While you’re there, review your public profile, as this setting outlines what will be seen when you are found via Google search. Switch on all the relevant options, and make yourself extremely visible to the outside world! Finally, don’t be like everyone else. Show that you are unique and different, and share content and have a profile which proves every last aspect of you. Do you like to juggle? Put that on there! Do you like to go canoeing? Same again. 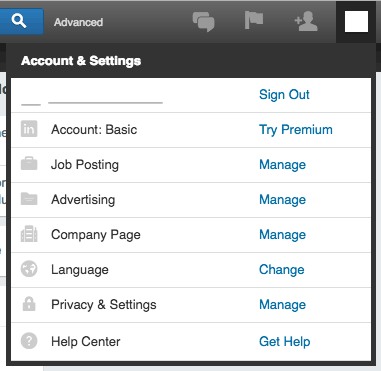 LinkedIn is an extremely powerful tool, if used correctly. Do above and beyond the necessary and make your profile as strong as it can be!